270 pages | 28 B/W Illus. This book explores the new product development process of firms developing frugal innovation for the base-of-the-pyramid (BOP) markets in developing countries. Frugal innovations are products characterised by an affordable price-point, durability, usability and core functionalities that are highly adapted to BOP consumers’ needs. Frugal products have the potential to drive the development progress and living standards of low-income consumers. 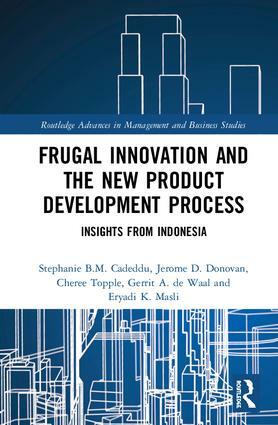 With an innovation framework developed from worldwide frugal case studies, this book provides detailed insights through two in-depth start-up firms in Indonesia that have successfully launched frugal products for the low-income market. These two start-ups have addressed two major development challenges for not just Indonesia, but also the global BOP market – traditional methods of cooking and access to clean drinking water. A detailed roadmap is developed from insights into the processes and management decisions of these two start-ups and combined with previous studies on frugal products. Providing a detailed roadmap across the different phases and stages of the new product development process when developing frugal products, this book will be insightful to not only innovators but also investors and government agencies supporting their activities. Stephanie B.M. Cadeddu is a Research Associate at Swinburne University of Technology, Melbourne, Australia. She has extensive experience working with start-ups, including through field research in Indonesia. Her research and teaching interests include frugal innovation, social impact and community development. Jerome D. Donovan is a Senior Lecturer in Entrepreneurship and Innovation at Swinburne University of Technology in Melbourne, Australia. He is also a Principal Advisor in Technology Entrepreneurship and Commercialisation Development with the Ministry of Science and Technology (Vietnam). His research interests include innovation and entrepreneurship, sustainability and development. Cheree Topple is the Deputy Chair of Management and Marketing at Swinburne University of Technology in Melbourne, Australia. Her research interests span issues of human resource development and sustainability, with recent publications in Environmental Impact Assessment Review, Transnational Corporations and Impact Assessment and Project Appraisal. Gerrit A. de Waal is a Senior Lecturer in Entrepreneurship and Innovation at RMIT University in Melbourne, Australia. His current research is in frugal innovation, having published in R&D Management, IEEE Transactions on Engineering Management and the International Journal for Innovation Management. Eryadi K. Masli is a Lecturer in Entrepreneurship and Innovation at Swinburne University of Technology, Melbourne, Australia. He was a former investment banker, working across Southeast Asia. He is also a Principal Advisor to MANIFEX, a private equity fund. His research interests include start-up funding and innovation.